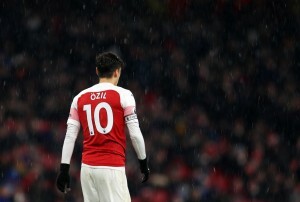 Arsenal endured a difficult time at the Etihad last weekend, going down 3-1 to Manchester City and losing ground to their top four rivals, Manchester United and Chelsea. That defeat ensured Arsenal slipped two places on the table and currently sit in sixth, a point below Manchester United in fifth and three below Chelsea in fourth. However, there is hope for the Gunners to revive their fight for the fourth spot as they visit struggling Huddersfield, who sit bottom of the Premier League table. Unai Emery could be making a few changes to his side that lost to City, although these could be only to shift a few personnel, especially in defence. Shkodran Mustafi was added to the defensive casualty list as he was substituted with a suspected back problem. However, reports are suggesting the German might be back in training, although Emery is likely to use his other options against Huddersfield and keep Mustafi fit for the upcoming UEFA Europa League tie. The other major area of concern is the right-back spot, where Arsenal have fallen short since Hector Bellerin’s injury. Additionally, the fitness issues faced by Maitland-Niles has seen Stephan Lichtsteiner take the place, with the Swiss veteran coming in for much criticism since then. There is a chance Emery might give Carl Jenkinson a chance there against Huddersfield. Meanwhile, Bernd Leno is set to continue in goal, while Jenkinson might come into the side at right-back for the ineffective Lichtsteiner, as suggested earlier. In Mustafi’s place, the Arsenal boss could give the returning Konstantinos Mavropanos a chance to impress at the heart of the defence, where he could partner captain Laurent Koscielny. Sead Kolasinac should continue in his role as the left-back, keeping Nacho Monreal on the bench. In midfield, Denis Suarez could get his first start since joining on loan from Barcelona on deadline day last month, as Granit Xhaka is still out on the sidelines with an injury. Suarez could be part of a three-man midfield with Matteo Guendouzi and Lucas Torreira giving him company. In attack, Henrikh Mkhitaryan has regained fitness, although the Armenian could need some more time to be starting games. As a result, Emery is likely to keep Alex Iwobi in the side, with the Nigerian being joined by Alexandre Lacazette and Pierre-Emerick Aubameyang in the attacking trident up front.